Creating a matrimony profile requires supplying vast amounts of personal information about ourselves. If you're not nervous about that, you should be. Whilst the majority of us are good people, there are a few bad eggs out there looking to cheat and commit fraud whenever the opportunity arises. As we become more and more connected online, crimes such as identity theft and extortion are on the rise. Although online matrimony services can be perfectly safe, as with any activities you perform online there are guidelines you should follow to protect yourself. Obviously the first step in your online matrimony journey will be selecting a portal from the thousands that are available. When we say thousands, you are probably thinking that we've made a mistake. Surely there can't be that many, right? Actually there is and here lies our first problem - how to identify which portals are safe. Almost daily there are new portals being released with the operators expecting instant and easy profits. In fact, so many matrimony sites are being created that there is a market for Internet companies to sell pre-made, "turn key" software and all the purchaser needs to do is install it and give it a name. Unfortunately for the owners of these new sites, there is no getting rich quick. On the contrary, running a matrimony company is hard work and ninety-nine percent of all new portals are abandoned after 12 months. 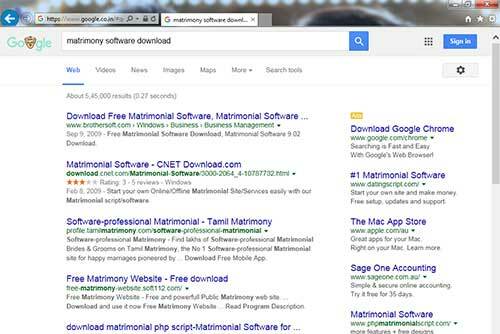 If you perform a simple Google search for "matrimony software" you will find several Internet companies advertising pre-made matrimony sites. Many of them actually boast and provide links to companies which are running their software. The most concerning problem with sites using pre-made, third party purchased software is that they are generally the most insecure and vulnerable to being hacked. If a site is hacked then all your personal information including phone numbers, email addresses, passwords and bank details maybe stolen. A quick Google shows just how easy a dangerous site can be setup. The reason that such sites are deemed insecure is simple. The operator purchased the software because they do not have the technical ability to build and configure their own site from scratch. If they do have the technical ability to build their own site, they do not have the time and are in a rush. Both scenarios result in web sites that contain bugs, are misconfigured and are not monitored - easy prey for hackers. If the operator discovers a problem with their site, they probably do not have the ability to fix the issue as the software is not their own. Even worse, a lot of matrimonial portals out there are running third party software which they purchased from Internet companies that no longer exist. * The creator of the software has left their name or a link to their Internet company at the bottom of the site. * The site is not optimised for mobile phones. Try viewing the portal from a smart phone. 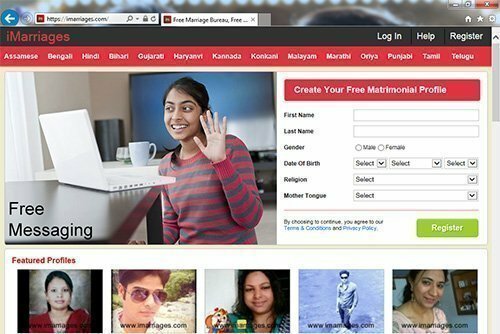 * Google the name of the site plus "matrimony software" - the creator of the site may show in the results. * The site is very similar looking to other matrimony portals. * There are informational links that lead to blank pages. Besides being inherently insecure, portals running pre-made software are highly likely to be operated by people looking to get rich quick. As a result, the life time of the site will be short and the number of visitors very low. The likelihood of finding a partner on one of these sites is low and therefore not worth the risk of sharing your personal information with. Malware allows a criminal to take control of your computer. They may use it to record your banking details, steal your private documents or even hold you to ransom. To have your computer infected with malware in the past, criminals typically had to trick you into clicking on a bad link. Today they are much more advanced in their tactics and your computer may become infected simply by visiting neglected or poorly managed sites. Although it's difficult to know if a site has been hijacked by criminals and used to spread malware, computer security companies like Symantec offer web site safety reports. These reports indicate if any problems have been detected within a site. iMarriages safety report can be found here. To check the safety of other sites, simply type their URL in the search box at the top of their site. As mentioned earlier, operating a matrimonial company is a lot of work. iMarriages in particular receives thousands of new profiles and to protect our existing customers, each new profile must be manually screened. 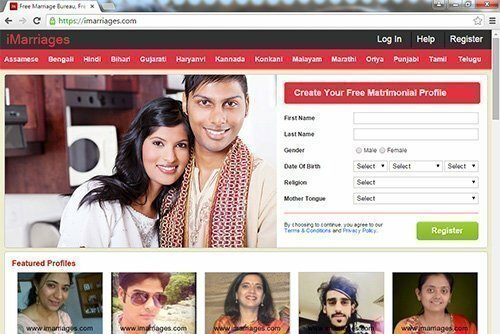 Would you expect to see Africans creating Hindu matrimonial profiles? We wouldn't either. These profiles are fake and sites that do not filter such profiles should be avoided. What a secure site looks like in Internet Explorer. The padlock located on the right side of the URL bar is closed. Are photos on the site watermarked? Watermarking is the term given to branding photos that are uploaded. At iMarriages, you will notice that photos are marked with "www.imarriages.com" to prevent them being saved and used fraudulently. Do not upload your photos to any site that does not watermark them. Such sites do not value your privacy or security. Does the site encrypt its communications with you? It is easy to eavesdrop on the Internet. To prevent others from listening in on your conversations, a site should force all transmissions to be encrypted. This is achieved by implementing Secure Sockets Layer or SSL for short. Examples of sites that are encrypted are Google, Facebook, Paypal and iMarriages. It is easy to tell if the site you are using is encrypted as the padlock in your browser will close and the URL bar may turn green. The URL will also start with HTTPS rather than just HTTP. Creating a site that is encrypted is not cheap, but if a company is willing to spend the money then this is a good sign that they care about your privacy. Is it possible to chat with other members via the site? A lot of sites do not have the ability to allow you to chat with other members. Instead of providing a chat platform they simply allow you to share your contact details and encourage you to then meet offline. It is much safer if you can chat with a person via the site before providing contact details and taking things offline. iMarriages does not publish your email address on your profile as we consider this to be a security risk. Some portals however will publicly display your personal email address with your profile. If you decide to register with a portal which behaves in this manner then we highly recommend you create a secondary email address at Gmail or Hotmail just for use with the portal. What a secure site looks like in Chrome. The padlock on the left side of the URL bar is closed and green in colour. If your email address is being publicly displayed, you will receive emails containing viruses and risk all your online accounts being hacked. When communicating with others online it is important to remember that they are strangers. Although iMarriages allows people to chat via the site we are astounded at the number of people who after a few short sentences exchange their email addresses, phone numbers and sometimes even their address. We highly recommend you stick to communicating via the chat systems provided on the matrimony portals until you are ready to take the next step. If the person becomes unfriendly or is not who they portray themselves to be, you can simply block them on the site and not have to worry that they have your details. Do not give money to people you meet online. If a site is filtering its profiles then this problem is rare but unfortunately it still can occur. If somebody requests money, report them and block them - no matter what the reason for the request is. This includes people you may have been communicating with for months. If somebody is requesting to meet you after only a day or two of chatting, this is alarming behavior. Do not meet this person. When you have spoken with someone for sometime and decide it is time to meet in person, we recommend you meet somewhere in public such as a coffee shop. If you are going alone, let your friends and family know of your plans. As charming as the person may be, do not leave with them after the first time you meet. In conclusion, there needs to be a degree of caution involved when providing your information to anybody, whether it is online or offline. The best thing you can do is stick with a brand you can trust.